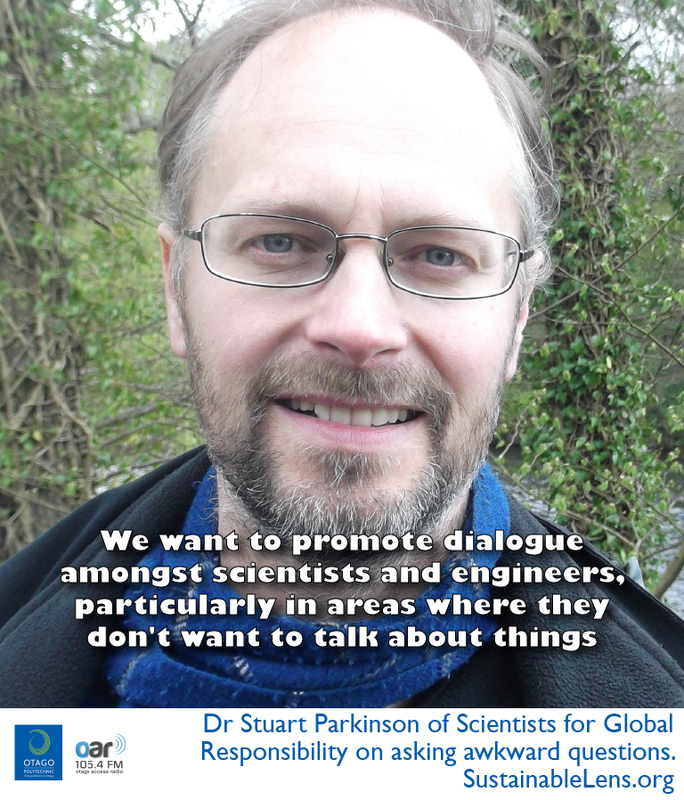 Dr Stuart Parkinson is Executive Director of Scientists for Global Responsibility. There’s an acceptance of the arms industry – “it keeps us safe” – we want to question that. We try and fill gaps, ask the awkward questions. Not just responding to problems with a technofix – another technology. Part of the concern is that technology is often grabbed as a simple answer and it turns out not to be – it might deal with one problem but create another. The term activist is so often used as a pejorative. If it’s about about questions, proposing different solutions to mainstream, challenging systems and offering something constructive, then it’s an activist organisation. Working in the arms industry made me ask awkward questions, ones I hadn’t faced before – severely questioning what I was doing. One of the challenges of the environment is ‘oh we don’t need to worry about that because it is too uncertain’ but on the other hand, we’re willing to believe economists, where the uncertainties are orders of magnitude bigger than the environmental ones. We’re willing to take at face value economic models…despite being hugely unreliable and based on so many assumptions you can make them prove whatever you want according to your political viewpoint. We’ve developed an economic system that’s not very stable (or fair or sustainable) so takes a lot of tuning – our news has become fixated on this. (why sticking to growth narrative) because we haven’t come up with an alternative economic model that works in the way we’ve become used to. SGR has ethical principles rather than specific polices on every subject. We encourage debate and discussion to apply principles. Some scientists can create a new technology, and other scientists can ask awkward questions about that technology – like what’s the impact, social implications and will it improve quality of life. We’re being driven along by an economic imperative, not considering broader pros and cons. We’re breaching environmental limits, some clearly, others either we don’t know or we will breach them in few decades – and that’s really scary. We need to change norms of international behaviour that says nuclear weapons are unacceptable for anybody to have. Codes of ethics (in professional bodies) are very narrow. Our organisation’s name is Global Responsibility – derived from social responsibility, corporate, environmental responsibility. Ethics so often in professional institutions is interpreted very narrowly – professional ethics of do you job well, don’t lie, don’t plagiarise, don’t make something that’s going to blow up as soon as you’ve sold it. We think that’s far too narrow, you’ve got to think about your role in society, your place in society as an engineer, as your company, as your profession – and think are we doing the right thing? Making things unacceptable is a very powerful idea. At the moment nuclear weapons aren’t something to be ashamed of for a lot of countries – chemical weapons are, biological weapons are – that shame that comes with breaching international law that’s built up over a couple of hundred years – its more powerful than people realise. (What do we need to do to preload students with awkward questions?) 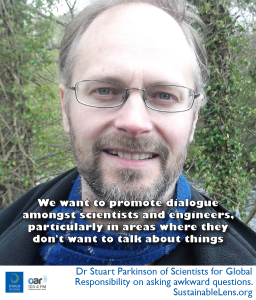 We want to inspire students with science, give them at least sight and experience of something else. The science and technology that is presented as exciting, especially for boys, is things like explosions, fighter planes and warships…we’re trying to present an alternative to that, still desirable, kind of nicer, this is what society is about, helping each other and using technologies that help us to help each other. And this is how is how you can live a good life – not being dazzled by the flashing lights and loud noises of the problematic technologies. Being affected enough to make a different choice in their lives. This conversation was recorded in the Common House at Lancaster Cohousing (see earlier conversation with Cathy and Alison).